In the 19th Century, Ynys Pandy was a fulling mill, cleaning sheeps` wool with fullers earth before the weaving process. In the early 20th Century it was a farm and for 30 years it has been our family home. People who know Ynys Pandy tell us it is a special place and we invite you to experience the peace and sense of space for yourselves. Beautifully furnished and well equipped, we sleep eight plus a cot and welcome well behaved pets, bearing in mind that there are sheep in the field. Ynys Pandy is secluded but not remote, tucked away off a minor road and situated at the top of a lovely tree-lined drive. 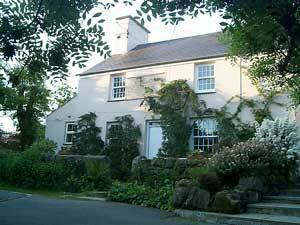 The house is surrounded by thirty five acres of beautiful environmentally sensitive fields, grazed by a small flock of sheep, sometimes cows and always horses, with the northern fields being bordered by the Snowdonia National Park. Views are 360 degrees all around; Cwm Pennant and Moel Hebog to the North, Cardigan Bay and the Irish Sea to the South, Cwmystradllyn to the East and the Llyn Peninsular to the West. As well as the mountains and beaches there are numerous activities and attractions - Snowdonia, Anglesey, Llyn Peninsular and Harlech are all within easy reach. Ideal for exploring, walking, climbing or relaxing. For shopping the seaside villages of Porthmadog and Criccieth are a 10 minute drive, Caernarfon with it's Castle 20 minutes and the University City of Bangor 40 minutes, all offering a good variety of restaurants, bars, cafes and pubs. And at the bottom of our drive is perhaps the last independent working Woollen Mill in the UK, while the road we stand on is a part of National Cycle Route 8, which can lead you to the nearby narrow gauge railways of the Ffestiniog and The Welsh Highland Light, castles and the wonderful folly which is Portmeirion, The Village.